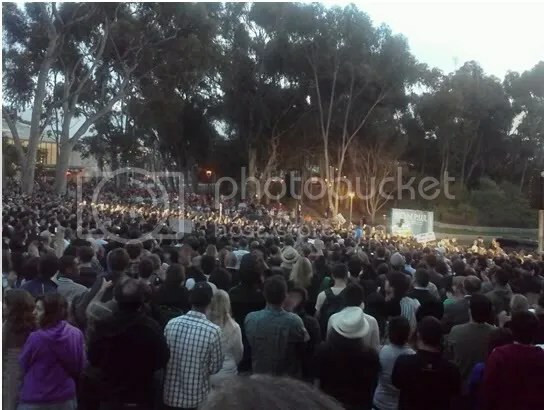 Throughout Ron Paul’s May 4 speech at University of California, San Diego’s Warren Mall, his non-interventionist foreign policy was emphasized as he related it to current global events. His notion of liberty and non-intervention spans all the way from domestic issues, such as the recent abuses by the DEA on UCSD student Daniel Chong, to foreign policy, such as the dangers of the neoconservative notion that the United States has a responsibility to protect civil liberties of people around the world. Paul argued that the United States should not be in the business of telling other countries what to do, and we should focus instead on protecting the civil liberties of people here in America – civil liberties that Paul believes are being threatened by an increasingly powerful federal government. This type of thinking is in sharp contrast to the traditional neoconservative ideas of security prevalent within the GOP and the current Democratic administration, earning Paul a reputation for having “wacky” ideas. However, these ideas are not new and seem to be grounded in principles of friendly interaction with other countries as a means to security, prosperity, and the maintenance of liberty. Rejected by the GOP and by liberal Democrats, perhaps Paul should be given more credit for his consistency, adherence to the Constitution, and refusal to mold his platform in order to fit neatly into either the Republican or Democratic camp. If nothing else, his proposed foreign policy is consistent and backed by historical evidence. Whether elected or not, Paul’s platform is one that should be given serious consideration for our future interactions with other states, especially considering the diplomatic messes of the past few administrations, Republican and Democrat alike.